New to predictive analytics? 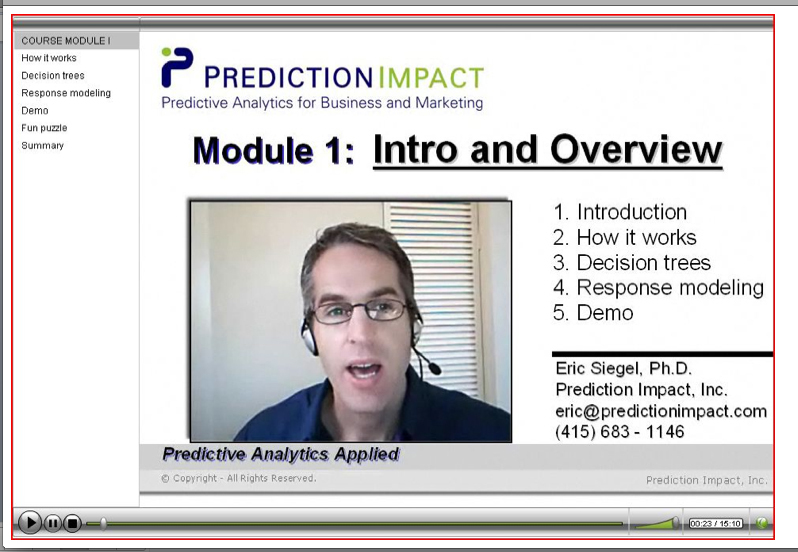 Take this online course to ramp up before Predictive Analytics World. Technology Experts. Analysts, BI directors, developers, DBAs, data warehousers, web analysts, and consultants who wish to extend their expertise to predictive analytics. Knowledge Level: No background in statistics or modeling is required. The only specific knowledge assumed for this training program is moderate experience with Microsoft Excel or equivalent. Attendees will receive 3 months of unlimited online access, a course materials book, and a certificate of completion. Business metrics do a great job summarizing the past. But if you want to predict how customers will respond in the future, there is one place to turn — predictive analytics. By learning from your abundant historical data, predictive analytics delivers something beyond standard business reports and sales forecasts: actionable predictions for each customer. These predictions encompass all channels, both online and off, foreseeing which customers will buy, click, respond, convert or cancel. If you predict it, you own it. The customer predictions generated by predictive analytics deliver more relevant content to each customer, improving response rates, click rates, buying behavior, retention and overall profit. For online applications such as e-marketing and customer care recommendations, predictive analytics acts in real-time, dynamically selecting the ad, web content or cross-sell product each visitor is most likely to click on or respond to. 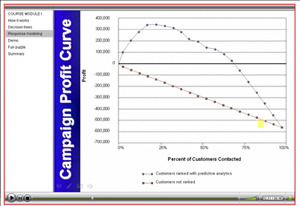 Applications: Business, marketing and web problems solved with predictive analytics. The many ways its predictions can be used to drive various business decisions. Core Technology: How a predictive model works and how it's created. What a predictive model looks like under the cover. What data is required for predictive modeling. Management: Project leadership and business process for predictive analytics; the organizational challenges and how to overcome them. Predictive Analytics Applied includes four jam-packed training modules of 60-90 minutes each, totaling 5 ½-hours of viewing time. This online program is internationally-friendly (but is only available in English) - registrants have participated remotely from 31 countries: Australia, Belgium, Canada, China, Denmark, Finland, France, Germany, India, Ireland, Isle of Man, Italy, Mexico, The Netherlands, Norway, Poland, Portugal, Russia, Saudi Arabia, Scotland, Singapore, South Africa, South Korea, Spain, Sweden, Switzerland, Turkey, United Arab Emirates, United Kingdom, United States, and Uruguay. Unlimited access for three months: View the training module videos as many times as desired for three months, easily skipping to any topic or sub-topic of the training program. Certificate of completion: An official Prediction Impact certificate with your name and the instructor's signature. Course materials book: Over 100 pages of material that corresponds with the presentation slides shown in the training videos (one book page per slide), and contains additional detailed notes, references and pointers to online resources. Online Video Format. This online training program consists of high-quality videos recorded for online viewing (not the recording of a live seminar). The videos consist of training content, software demos and intermittent instructor appearances, with verbal instruction throughout. The video image is large - the resolution is 800 by 600 (960 by 655 including video control areas), which is a large portion of your screen - possibly the entirety of your screen, depending on its resolution. Each of the four training modules of this self-paced e-learning program may be viewed at your convenience, pausing, rewinding and fast-forwarding as needed. Within each module, jump to each sub-topic immediately with a single click, and, within each sub-topic, step forward and back at will. Since the contents are concentrated, a recommended pace is to view one module per week. On the faster side, the entire program may be "crammed" in just four days by viewing one 60-to-90 minute module per day. Business-focused. Unlike other training programs that also cover scientific, engineering and medical applications of data mining and analytics, this seminar focuses squarely on solving business and marketing problems with these methods. Comprehensive across business needs. Within this realm, however, we step beyond the standard application of response modeling for direct marketing to solve a wide range of business problems. Vendor-neutral and method-neutral. This training program, which is not run by an analytics software vendor, provides a balanced view across analytics tools and methods. On-demand access for three months: View the training module videos as many times as desired for three months, with easy navigation to any topic or sub-topic of the training program. This gives you the opportunity to revisit portions of the course as needed, even after attending Predictive Analytics World. You will receive access to the online training program by way of an email sent within two business days of registration (please check your spam folder if you do not see the message within two business days). The president of Prediction Impact, Inc., author of the acclaimed book, Predictive Analytics: The Power to Predict Who Will Click, Buy, Lie, or Die, Executive Editor of the Predictive Analytics Times, and the founder of Predictive Analytics World and Text Analytics World, Eric Siegel is an expert in predictive analytics and data mining and a former computer science professor at Columbia University, where he won the engineering school's award for teaching, including graduate-level courses in machine learning and intelligent systems - the academic terms for predictive analytics. After Columbia, Dr. Siegel co-founded two software companies for customer profiling and data mining, and then started Prediction Impact in 2003, providing predictive analytics services and training to mid-tier through Fortune 100 companies. Dr. Siegel is the instructor of the acclaimed training program, Predictive Analytics for Business, Marketing and Web, and the online version, Predictive Analytics Applied. He has published over 20 papers and articles in data mining research and computer science education and has served on 10 conference program committees.